All available prints are made from digital scans or high quality photos of the original artwork. They are printed on archival quality paper with EPSON UltraChrome Hi-Gloss2 pigment inks for extra durability and lightfastness. Finished prints are mounted and backed with a white core mount board using acid-free tape hinges. Each mounted print is labelled on the back with the title of the artwork and the artist's signature and wrapped in a transparent polypropylene bag for protection. Ready to frame prints come in a standard mount size of 16x12 inches (406x305 mm). 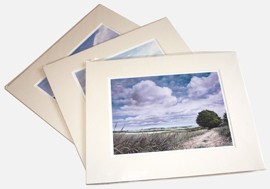 Square format prints are in a standard size of 12x12 inches at the same price. Ready-made frames for these sizes are available from most hardware shops and craft stores but it's recommended that you consult your local picture framing shop for a better choice and quality of frame. Larger limited edition fine art quality prints are also on sale at Hampshire Framing.